Ah, the dunes of the Cape... they've been written about, sung about... and they're probably one of the first images that pop into your head when you envision Cape Cod. And yet, many tourists visit Cape Cod without ever really experiencing one of New England's most remarkable natural wonders. It's easy to get caught up in all of the other enticements of the Cape... sandy, family beaches; villages teeming with cute little shops; seaside seafood shanties... but you haven't truly been to Cape Cod until you've done the dunes. Of the 44,600 acres that comprise the Cape Cod National Seashore—New England's most visited national park—4,000 of them make up two-thirds of the town of Provincetown at the very tip of the Cape. It is here that you'll find the most dramatic dune views. The enormous sand deposits were left behind when Ice Age glaciers receded. It's difficult to imagine, but the dunes were covered with a layer of soil and densely forested before the arrival of European settlers. Deforestation led to massive shifting of sand as the winds sculpted the exposed landscape. Efforts to stabilize the dunes began in the 1800s, and the National Park Service has continued beach grass planting efforts since 1961, when the Cape Cod National Seashore was created. Want to Experience the Dunes? There are several ways to see the dunes, but by far the most entertaining is Art's Dune Tours. This tour company has a history that is almost as long and storied as that of the dunes themselves. OK, I exaggerate a bit, but Art's Dune Tours has been in existence for 70 years. Art Costa first began sharing the wonder of the dunes with Cape Cod tourists in 1946 in a 1936 Ford Woody. Today, the family business is run by Art's son, Rob, and he and a "cast" of tour leaders keep alive the tradition of taking small groups of seven to nine passengers out onto the dunes in four-wheel-drive Suburbans. Now, you can go out on the dunes in your own four-wheel-drive vehicle, but obtaining a permit will cost you quite a bit of cash, there aren't exactly any road maps to follow and you'll have to entertain yourself with amusing anecdotes and corny jokes. It's much more relaxing and amusing to simply book passage with Art's Dune Tours, grab the camera and allow Rob or one of the other guides to regale you with tales of the dunes' animal and human inhabitants as you make tracks through the sandy turf. Art's Dune Tours operates from April through mid-November, and in addition to one-hour, narrated tours throughout the day, you can also reserve your place on a two-hour Sunset Tour with or without a BBQ, sushi or clambake dinner. Adventure tours are also available for guests who'd like extra time to paint or photograph the dunes; who want to combine dune touring with sailing, kayaking or speed boating, or who want to catch and eat their own dinner. Private charters for weddings on the dunes or other events are also available. Tours depart from 4 Standish Street in Provincetown—look for a small table set up on the sidewalk. Reservations are always a good idea, as tours only operate with a minimum number of passengers, and summertime can be quite busy. For reservations and pricing information, call 508-487-1950 or toll free, 800-894-1951. You can also book your tour online. First things first... arrive at Art's Dune Tours early for your tour, so you can secure a window seat. Rob Costa, our guide, explained that when 44,000 acres of Cape Cod coast were set aside in the 1960s for preservation and protection by the National Park Service, the local reaction was mixed. However, today, residents and visitors alike appreciate the beauty of what has been preserved. Fewer than 3,000 people live in Provincetown in the winter. The number of people in town swells to about 50,000 in the summer. Did you think that sand was all we'd see on a Cape Cod dune tour? Au contraire! There are several historic buildings within the Cape Cod National Seashore, including the Old Harbor Life-Saving Station. Built circa 1897, the station was originally located at Nauset Beach in Chatham, where it housed US Coast Guard lifesaving crews and served as temporary shelter for rescued persons. Beach erosion necessitated relocation of the station, so it was moved by the National Park Service to Provincetown in 1977. Are you interested in birdwatching? One of the unexpected sights on our trip was a pair of terns safeguarding their eggs, which were buried in the sand. We snuck up carefully in the Suburban so as not to frighten them away. Rob explained that terns come to the dunes of Cape Cod from as far away as South America to lay their eggs here. The site of the Pilgrims' first landfall wasn't Plymouth: It was Provincetown. The dunes looked very different then, Rob explained. "The dunes were completely forested at one time." Of course, the Pilgrims chose not to stay in Provincetown, and they headed further up the Massachusetts coast to settle. Rob explained the reason for the Pilgrims' decision: "Even back then, the shops were a bit expensive." Actually, their decision to move on was related to a lack of fresh water and farmable land. Later, Portuguese fishermen would settle the town and would turn Provincetown into a thriving fishing and whaling community. In fact, during Provincetown's golden years, residents had the highest average per capita income in all of Massachusetts. Beach grass helps to "anchor" the sand of the Cape Cod dunes, but there is still a subtle shifting of the landscape that is always occurring. Rob explained that his father, Art, started Art's Dune Tours in 1946 after he returned from World War II. He had worked for others before the war and was determined to own his own business when he returned. "He just loved taking people out here," Rob said. He added that his father told him if he were to follow in his footsteps, "You'll never get sick of what you're doing." And it appears that he doesn't, although he did tell us, "My jokes are always the same." Rob stops the Suburban at prime viewing spots, where we are able to hop out and take pictures of the magnificent sand dunes of Cape Cod. It is difficult not to appreciate what a talented sculptor the wind can be. During our excursion, the clouds seemed as if they were posing in order to complement the scenery. It is easy to see why this picturesque area was selected as the location for the filming of The Thomas Crown Affair in 1968. In fact, Rob explained that his father helped with transportation for the movie stars and crew. His mother, he said, still has a signed note from Steve McQueen thanking her for the coffeecake she baked for him. "Of course, my father had a big crush on Faye Dunaway, too," he said. Interspersed among the dunes in Provincetown are a number of small, rustic shacks. The first dune shacks were built in the 1800s by the Humane Society in conjunction with lifesaving efforts, but as lifesaving personnel moved to more solid facilities, the shacks were discovered by artists and writers, who flocked to the dunes of the Cape in the 1930s and '40s for inspiration. Among the shacks' notable inhabitants were poets e.e. cummings, Harry Kemp and Mary Oliver; painters Edwin Dickinson, Boris Margo, Willem de Koonig and Jackson Pollock; and authors Eugene O'Neill, Jack Kerouac and Norman Mailer. In 1989, the shacks were listed on the National Register of Historic Places, and the National Park Service took over ownership of all but one. Rob, our Art's Dune Tours guide, explained that several are still occupied by the original "squatters" and that others are leased by the Park Service to those who "bid" to obtain a 15-year lease. The cost is only about $3,000 per year plus maintenance of the shack, but before you get all excited, realize that these shacks have no electricity, no running water and outhouses. Also, the "bidding" process involves submission of an essay explaining why you'd want to live in a dune shack. "It goes to the people with the pen, not the dollar," Rob said. Five of the shacks are currently leased to non-profit groups that provide shorter "artist-in-residence" experiences for interested occupants. As our dune tour continues, Rob takes a moment to stop the Suburban to tell us more about Kemp, the "poet of the dunes." Kemp was a dune shack inhabitant for about 40 years until his death in 1960. Costa recited a 1934 poem by Kemp titled, "The Last Return," written for the Coast Guard men who have steadfastly worked to save the lives of those shipwrecked on Cape Cod's coast. As we leave the ocean behind and begin to head away from the sand dunes, the vegetation gets thicker, punctuated with scrub pines. The one-hour tour seems over in almost no time at all. Rob says he and his employees at Art's Dune Tours in Provincetown take all variety of visitors out to see the dunes each day—"gay, straight, young, old, children, families, single people—it really is a good thing for everybody to do." 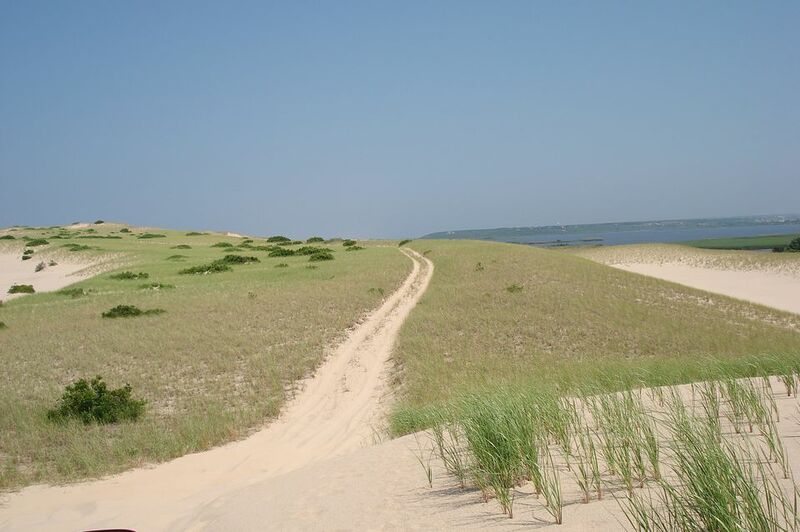 While a one-hour daytime tour of the sand dunes of Cape Cod is a wonderful way to "do the dunes," keep in mind that Art's Dune Tours does offer some other tour options that might provide an additional touch of fun or romance. Sunset tours provide stunning views and good food, too, as you enjoy a lobster clambake, barbecued chicken dinner or vegetarian or seafood sushi on a blanket spread out on the dunes. Race Point Lighthouse Tours are offered on Sundays. Private charters are available if you'd like to design your own outing. If you're an early riser, charter a sunrise tour in the wee hours of the morning and enjoy spectacular views as day arrives on Cape Cod. For more information, prices and reservations, call 508-487-1950 or toll free, 800-894-1951.